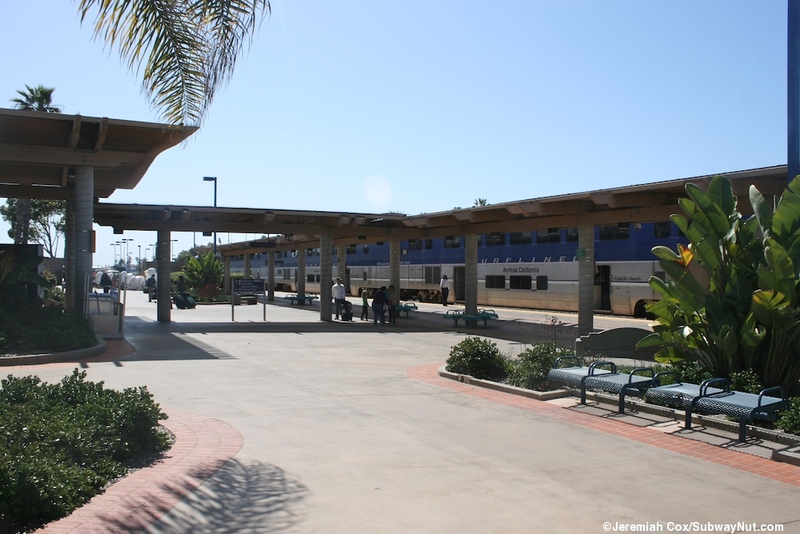 Oceanside has always been a station stop in the Amtrak-era. 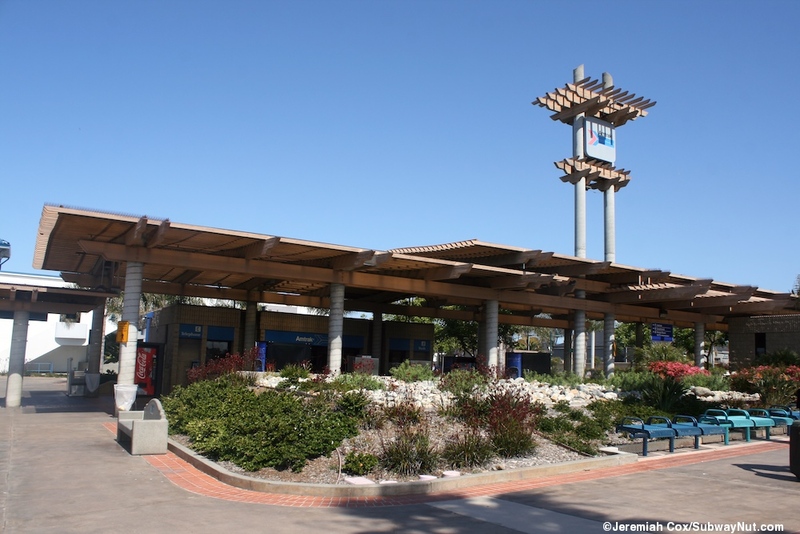 The present station, the Oceanside Transit center was dedicated in January 1984 when there were seven daily San Diegan round-trips. The station used to be in the historical ATSF depot a few blocks north of the station at 117 North Cleveland which was demolished in 1988 and is now a parking lot. 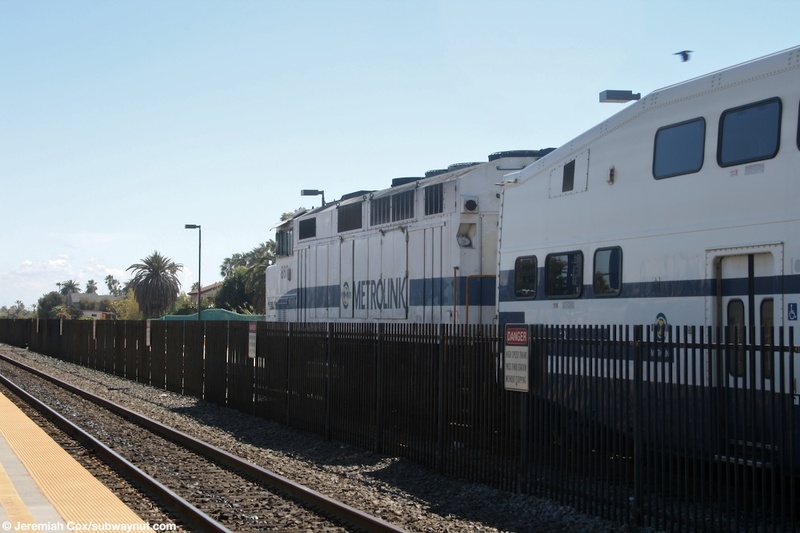 Commuter rail service to the station first began when Metrolink began three peak direction round-trips to Los Angeles on Monday, March 28, 1994 ('Orange County Joins Metrolink' Lodi News-Sentinel, Mar. 29, 1994, Link) and San Diego in the south when Coaster opened on February 27, 1995 with four inbound and one reverse peak trip. 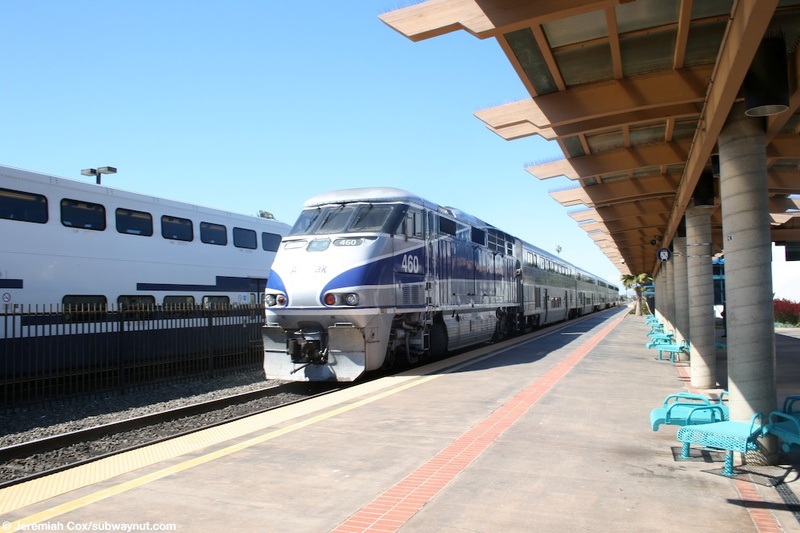 The Sprinter, a non-FRA compliant Diesel Multiple Unit Light Rail Line opened on March 9, 2008 at its separate tracks and stations (it is not allowed to run in mixed use with Amtrak, Metrolink or Coaster). 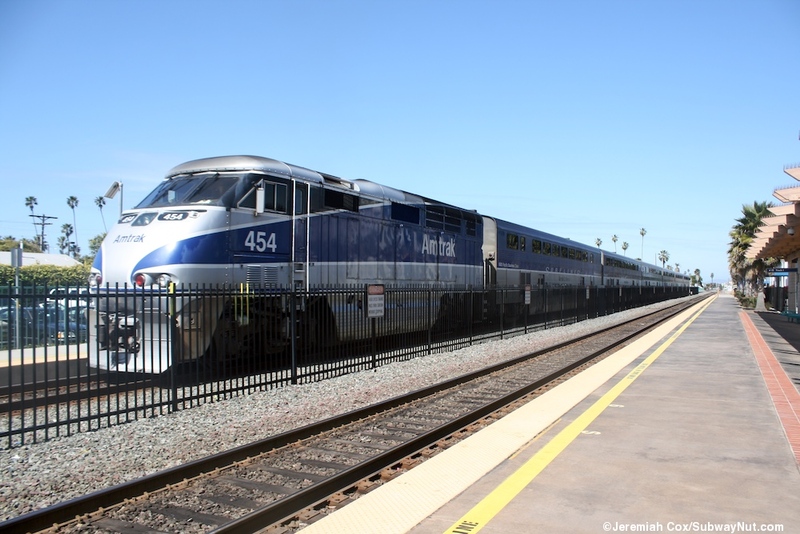 Monday thru Thursday rail service (not including the 34 Sprinter trips to Escondido) through the station is presently a total of 30 departing trains stopping or originating in the station: 11 Coaster trips south to San Diego and 5 northbound Metrolink Orange County Line trips to Los Angeles, these are supplemented my 3 more additional Metrolink trips, an OCTA sponsored trip to Fullerton and the Inland Empire/Orange County Line running one trip each to Riverside and San Bernardino. 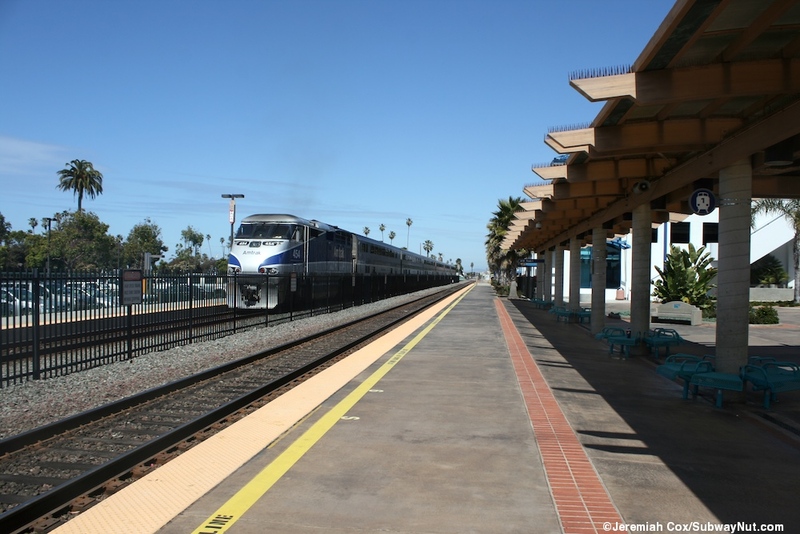 Amtrak's Pacific Surfliner 11 daily trains in each direction stop in the station, the only trains not to terminate. On Fridays there are two more Coaster round-trips. 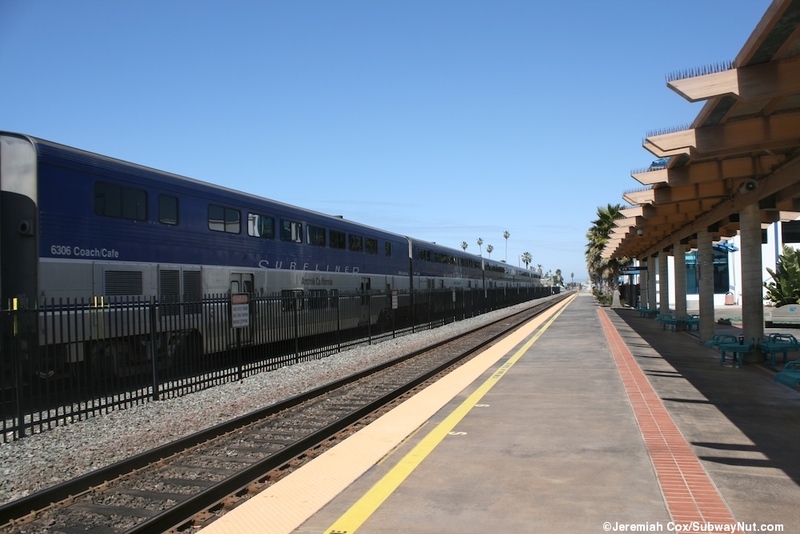 Weekend service is much more limited with 6 Coaster's on Saturday and 4 on Sunday and one Metrolink per Saturday and Sunday on each line. 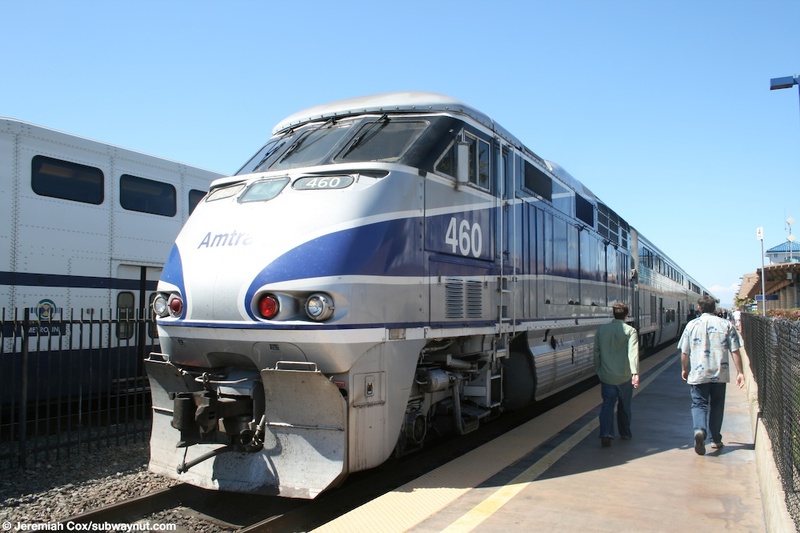 The Commuter Railroad's share a maintenance and storage yard north of the station at Stuart Mesa in Camp Pendleton, and an additional station on Metrolink and Coaster their for the military has been proposed. Trains stop at just one of two platforms on each side of two tracks in the station. These platforms each have a tactile warning strip and wheelchair mobile lift platforms at either end. The platforms are connected via a pedestrian underpass with staircase and ramp access towards the southern ends of the long platforms. The secondary western platform, for track 2, is completely bare of shelter and just has a green fence. 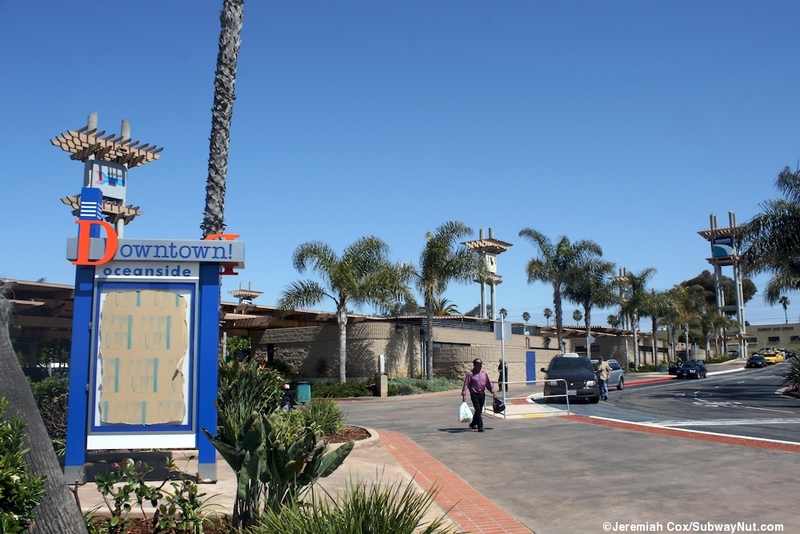 It is along a parking lot which consists of a few of the 995 total spaces claimed by Metrolink (Amtrak claims 180 short-term spaces and 80 long-term spaces) Tyson Street provides access directly to the underpass and the other end, 4 blocks, about 225 yards from the beach. 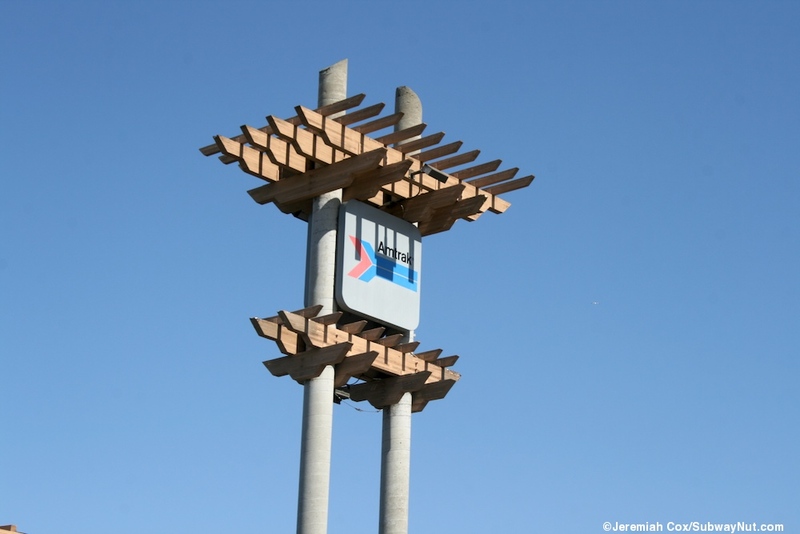 Track 1 is where the main station is and this is right in the middle of the platform, along the platform there are concrete beams holding a canopy made of wood with a translucent material allowing natural sunlight to shine through. There are little teal benches arranged around the concrete columns on the platform. 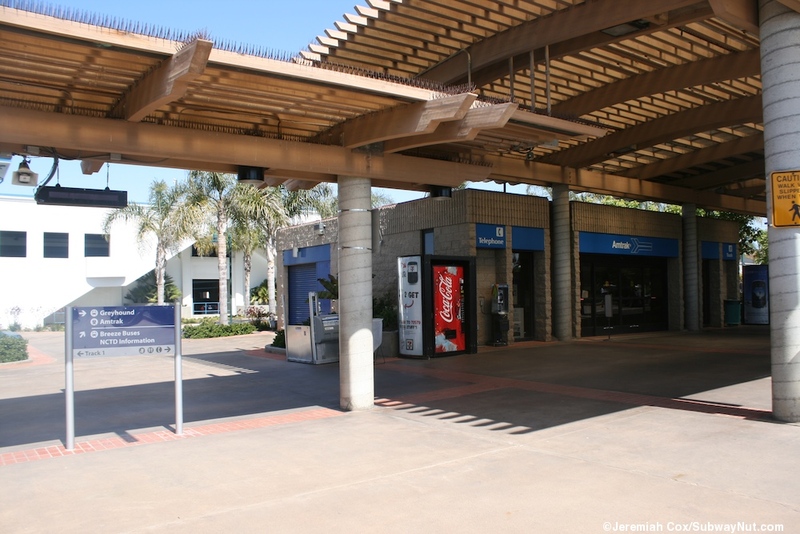 A central covered area with this same design extends straight back providing cover for a series of separate buildings with vending machines (both for food and tickets, different ones for Metrolink/Amtrak and NCTD) scattered along it and more little benches. 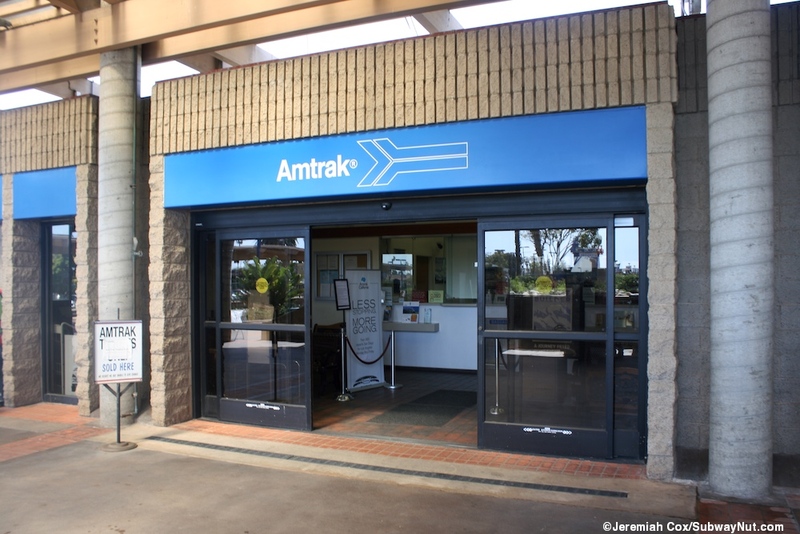 Closest to the platform is the Amtrak ticket office on the northside, beneath the Amtrak pointless arrow written on white on a blue background, the overall signage design for the station. 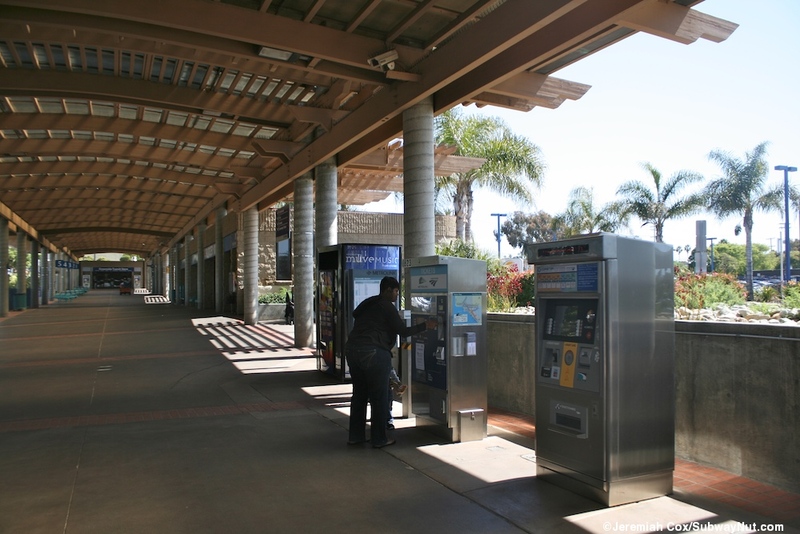 It is basically just two automatic doors that lead to a small area before the ticket windows that have a baggage scale and check between them. The next building contains a Berger King and then 5 bus bays for intercity buses is reached, these bays have the standard intercity pull-in and back-out design. 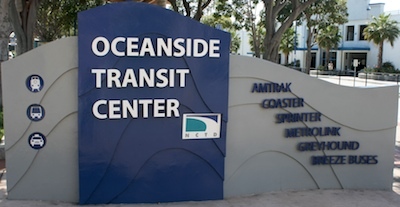 Across from them is a building containing the station's restrooms, and just beyond that at the end of the covered central area is building containing the Oceanside Transit Store for NCTD's Coaster, Sprinter, Breeze and Lift as well as Greyhound, Package Express, and Crucero. 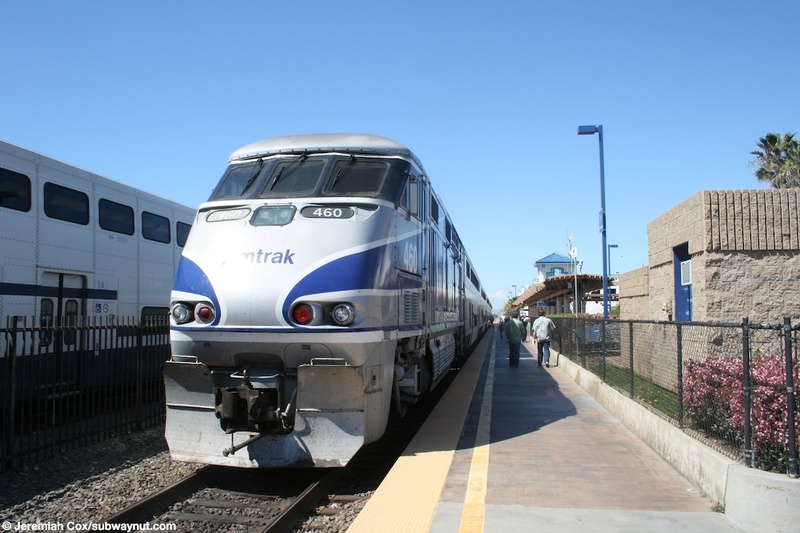 There are a few wooden benches for indoor seating, more than are found in the Amtrak section. 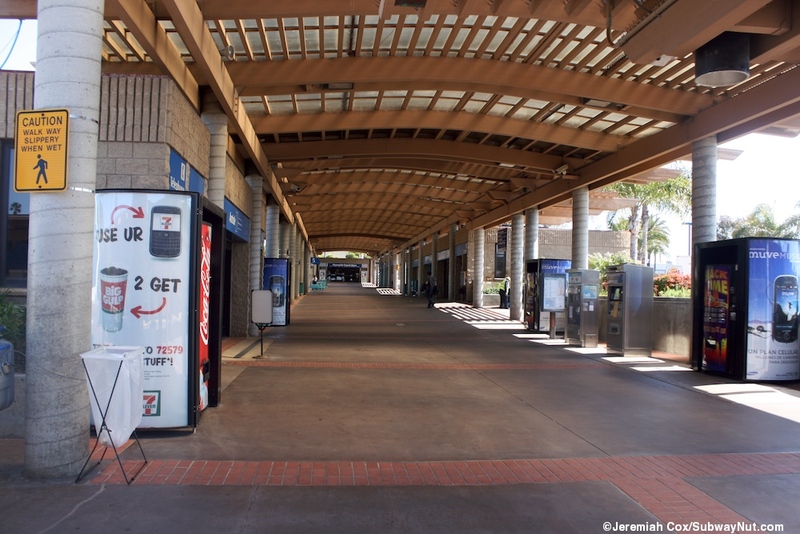 North of the intercity bus bays is the bus loop for local Breeze Buses. 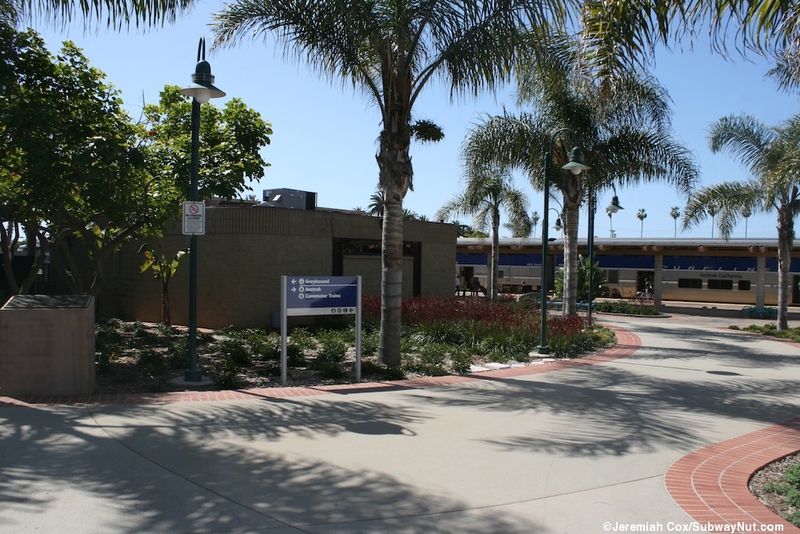 A two story transit parking garage, dedicated on April 19, 2006, is between the bus loop and the northern end of the platform for track 1. The southern end of the platform for track 1 yields to a plaza, the entrance to the underpass and the Sprinter platform just beyond. 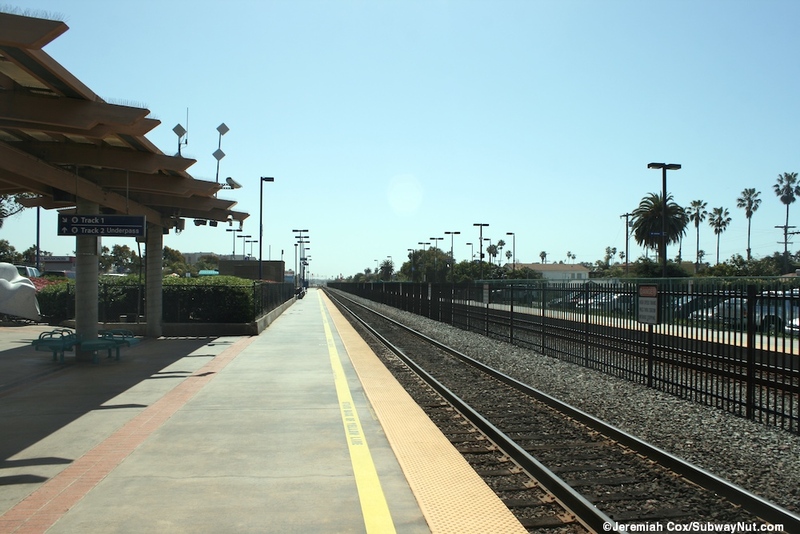 Looking across to the island platform with two tracks that is SPRINTER's terminus at Oceanside Transit Center, it is parallel to the other rail lines, and is quite crowded with people waiting for the train. 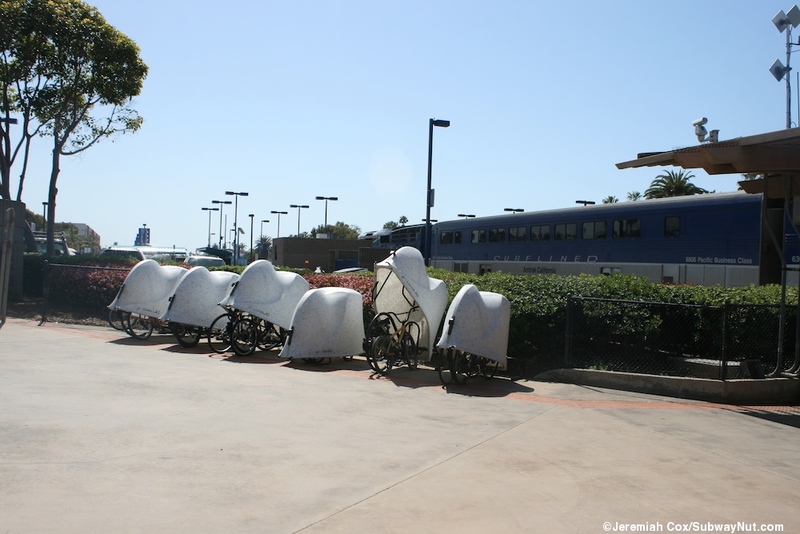 A view of the a shelter on the SPRINTER platform at Oceanside Transit Center. 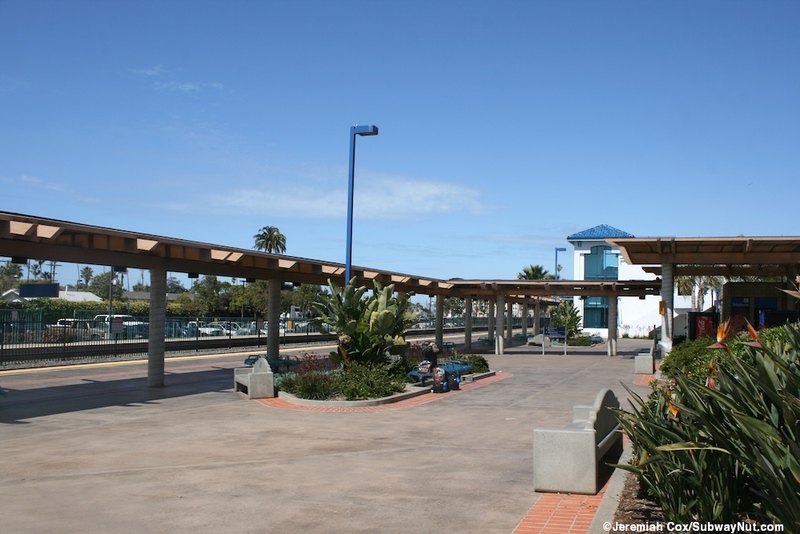 Another view of a sheltered area on the SPRINTER platform at Oceanside Transit Center SPRINTER banners still decorate the platform since the new rail system only opened a week ago. 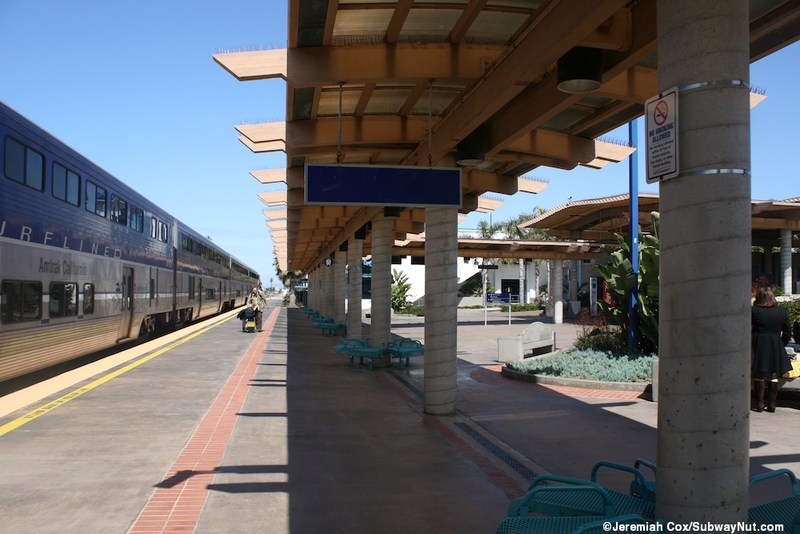 Passengers rush up to board VT642 Desiro DMU #4009, a single car SPRINTER train that has just entered the station to reverse and go eastbound back to Escondido Transit Center.